The next time you feel stress and anxiety riding on your shoulders, pick up a coloring book. Seriously, they're not just for kids anymore. Adult coloring books are the new way to unwind, and many health experts are on board. A handful of studies have shown that the effects of coloring could be positive: Participants in one study took a baseline test to measure anxiety levels, and then increased their anxiety levels by describing a scary experience. Immediately after, they were randomly assigned to color either a blank page, a design, or intricate circular patterns. Researchers found that coloring the designs an patterns decreased the participants' anxieties, while the blank page did not. "There is something about the mandala that is particularly soothing for people," Lacy Mucklow, an art therapist in Washington, D.C., told USA Today. The grown-up coloring books -- which feature highly detailed floral and geometric designs -- are selling like crazy. Roughly 12 million sold in 2015, up about one million sales from 2014. And the credit goes to Scottish illustrator Johanna Basford, who released her Secret Garden coloring book collection, which became an instant best-seller. Now, every Target, Barnes & Noble, and even Walmart has dedicated a section for adult coloring books. The trend has even helped the uptick of colored pencil sales, which saw about a 27 percent increase in 2015. Experts speculate that the rhythmic repetition of coloring helps tune out the outside world, which in fact releases stress. But, they quickly note, the moment of zen is not meant to replace actual therapy when needed, because of the relationship that's established between a therapist and the patient. 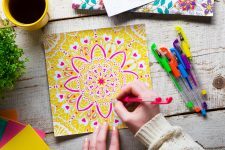 The American Art Therapy is behind the craze, too, releasing a statement saying it supports the use of adult-coloring books for "pleasure and self care."